Maybe you’ve wondered, on occasion of a press conference announcing another major terrorism bust: Why does it seem as if the FBI’s undercover operatives actually encouraged—even thought up—the plot? Why do the targets come off as hapless losers unable to organize so much as a poker game? How come it was the government that provided the fake conspiracy, the fake car bomb or missile, even the fake Al Qaeda oath? Nearly half the prosecutions involved the use of informants, many of them incentivized by money (operatives can be paid as much as $100,000 per assignment) or the need to work off criminal or immigration violations. With three exceptions, all of the high-profile domestic terror plots of the last decade were actually FBI stings. In all, this investigation reviewed more than 500 domestic terror prosecutions (for more details, see our charts page and searchable database). How did we identify them? The federal government unwittingly helped with this research in a huge way: Attorney General Eric Holder in March 2010 testified before Congress as the Obama administration sought to put 9/11 mastermind Khalid Sheikh Mohammed on trial in Manhattan—a plan it ultimately abandoned. One of the documents submitted to Congress was a list of all successful terrorism prosecutions from 9/11 through 2009. 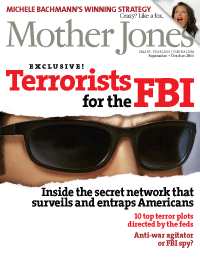 In addition to Aaronson’s yearlong investigation, our FBI package includes a piece by Mother Jones news editor Nick Baumann that confirms, for the first time, that the federal government has been using foreign regimes to detain and interrogate Americans. And MoJo reporter Josh Harkinson looked at how the FBI’s aggressive anti-terror tactics play out among left-wing activists, profiling radical-turned-snitch Brandon Darby. To allow you to make up your own mind about these cases, we’ve also published the underlying data for the package: A searchable database of terror cases, numerous documents we discovered in our research, even an FBI surveillance video. Look at them for yourself and decide: Is having the government make up terror plots the price we pay for safety?